In previous articles, we covered the Origami prototyping tool when it was still built on top of Quartz Composer. While the prototypes that Origami generated were always excellent, many people were a little bemused by the requirement for Quartz Composer. What even is it? Who uses it? "If only Origami worked with software we actually used every day – something like Sketch!" It seems Facebook listened – or at least had the same concern. In early 2017 Facebook's Origami was completely overhauled and relaunched to run as a standalone app. You won't need to install anything else to make it run on your OSX system. What's more, Origami will take your static Sketch files and make them live. Although it features significant UI changes, it is fair to say that the logic behind how you wire the patches together, and how you make your prototype work is still the same. In this tutorial, we will be covering the highlights and improvements of this major update and how to turn a simple Sketch UI file into a working prototype. Before we get started, if you don't already have Origami installed, you can go over to their website and hit the download button found here – yes, it's free. And to make it easy to follow along, we are going to use a prebuilt Sketch UI file that you can download here (it's free). 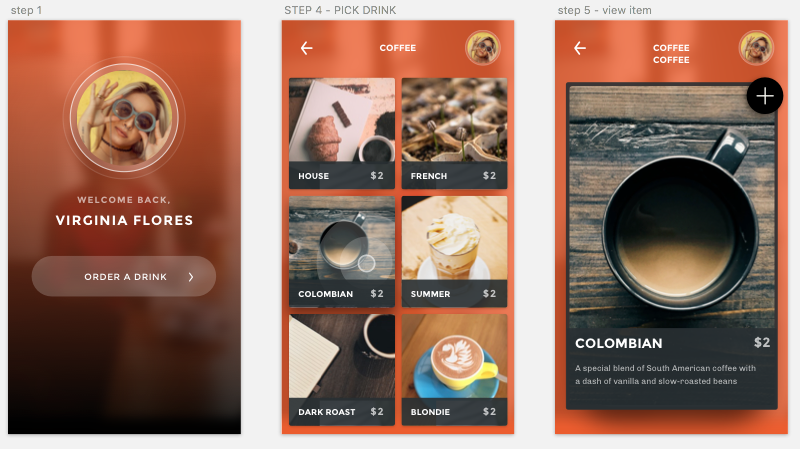 It is a Coffee ordering app composed of many Artboards, but we won't need to use all of them since this tutorial is going to cover the fundamentals of prototyping with Origami and Sketch. These are the three artboards we will be using – you can delete the others. The GIF below illustrates the result we will achieve by the end of this tutorial. Origami has four main panels you need to learn your way around. Inside the Viewer you can interact with your prototype. Origami layers are very similar to Sketch layers. Each layer has its own attributes and can be ordered and nested. In the inspector you can adjust it's behaviour by changing its attributes. You can access the patch library any time by using the CMD+Enter shortcut keys or by double taping on the patch editor area. To select and add a patch, select it and press enter. The patch editor panel is the empty looking area in which you wire together interaction, animation, and behaviour to your prototype using blocks. Without doubt, the biggest highlight of the new Origami Studio is the way it works with Sketch Files. 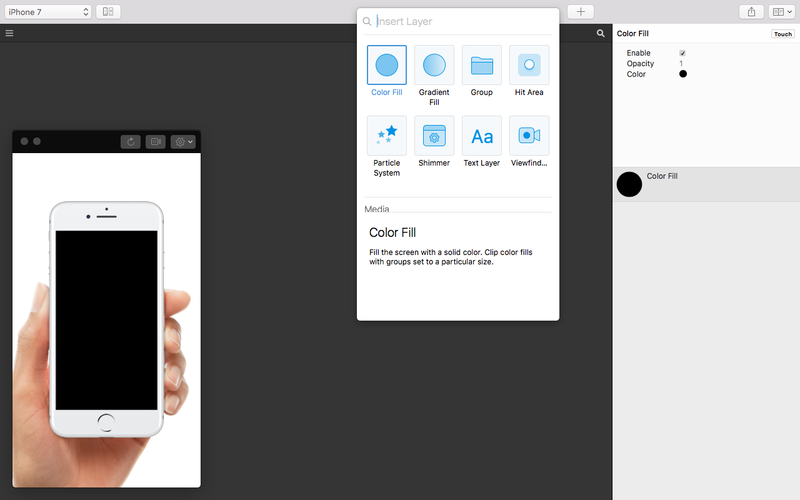 It is now very easy to turn your Sketch designs into working components and views. You can then wire those components together to create a working prototype out of thin air. Inside the Sketch design file, jut copy and paste the layers into the Origami project window as follows. When pasting, make sure to use the Origami layer inspector to adjust the position of the pasted layers. Also keep in mind to nest them inside the corresponding screen layers. After pasting and positioning all the elements of the first Artboard from Sketch inside Origami, add a Screen layer and nest all the pasted elements inside the Screen Layer you just added. Do the same thing for the remaining two Artboards. Copy and Paste the elements from Sketch inside the Origami project window, position them correctly through the inspector panel and then nest them inside the corresponding extra Screen layers you will have to create. But for these two new screens, you don't change the start state because logically we shouldn't see the next two screens when the prototype starts running. Our next step involves 'wiring together' the Screens. This will mean when you hit the button on the welcome screen, it will takes you to the screen two. Happily, Origami makes this very easy to do. On the right hand side of the layer you want to interact with, there is a small label that has the word 'Touch' written on it. Click it, and you'll see a dropdown of all available touch interactions. In this case, we just need the simple 'Tap' interaction (clearly this is an interaction you'll use often). The logic behind how the pages will show and disappear is as follows: When you tap the button, the tap interaction patch triggers a state change in the 'output' of our tap. This needs to be wired with the present attribute of Screen 2 layer at the inspector panel for that layer. After wiring those together, this is what the prototype looks like now. But what about going back? The logic is pretty much the same just with a little addition. Instead of just wiring the back arrow button from Screen 2 with the presented attribute in the inspector panel for Screen 1, we have to also dismiss Screen 2 by wiring together the dismiss attribute in the inspector panel of Screen 2 with the tap output of the interaction patch for the back arrow button as follows. 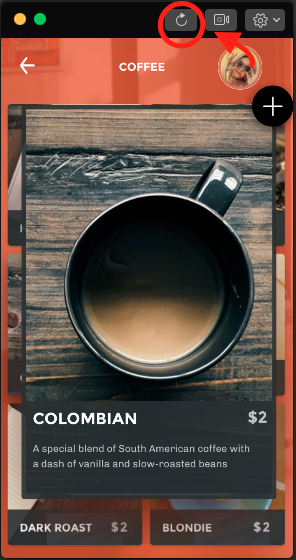 The last step to complete our prototype is to show a modal panel on top of Screen 2. To keep this demo simple, we will bind the whole group of options to the tap interaction. You're free to wire them to separate screens in your demo. 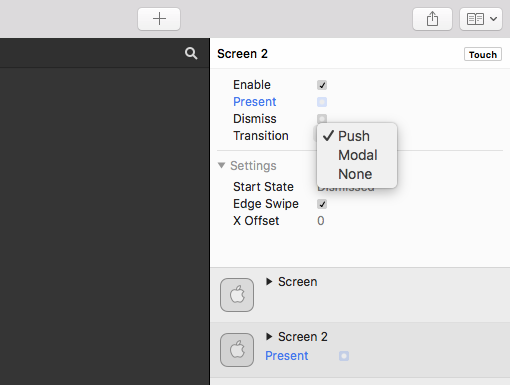 The logic behind launching the modal is the similar to before. 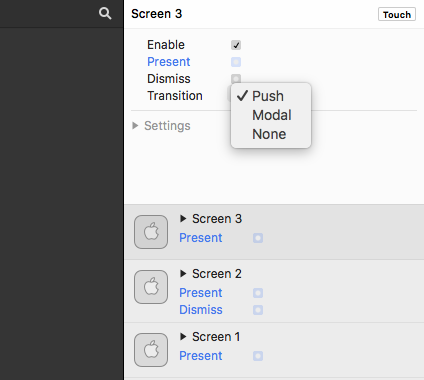 However, this time we will not be dismissing Screen 2 so that that the modal appears on top of it. Tip: To reset the screen so that we can see the whole result and test our prototype, hit the refresh icon on the viewer panel. This new approach to Origami is certainly easier to work with than its predecessor. Being able to use your Sketch files, without having to import each layer into the project individually, saves lots of time and hassle. Origami comes packed with tonnes of interactions and animations out-of-the-box, so there is plenty of space to experiment and explore once you understand the basic application mechanics. Understand that though we've purposefully kept this demo to simple clicks, there are few limits to the kinds of interactions you can build with Origami – a sophistication that is simply impossible with tools Invision or MarvelApp. Finally, you can download the files I have used: both the Origami final project file and the Sketch UI file here. Feel free to let me know of any questions in the comment section below.